Another holiday come and gone. 2010 is disappearing right before my eyes! The girls’ costumes this year were pretty much all last minute decisions. Goose was a little bit harder. She had her heart set on being Hobo Sleeping Beauty, which would be Sleeping Beauty in her non-princessy attire. 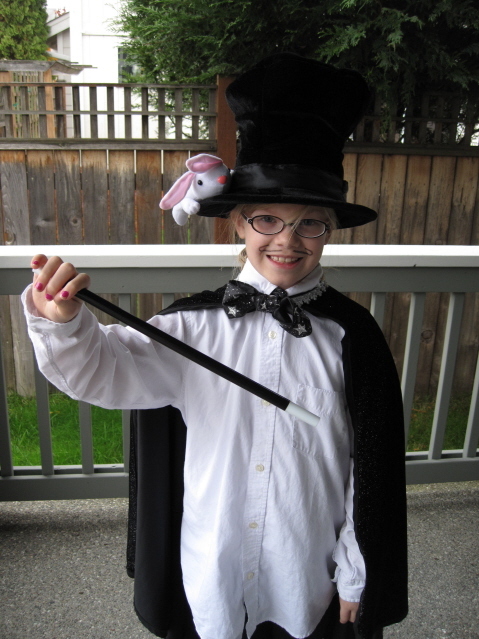 I was not up for the Hobo Sleeping Beauty challenge, but after about a dozen costume ideas rejected, we finally settled on a magician. I was originally going to construct her hat out of black posterboard (because we’re ghetto like that—see aluminum foil princess brooch above), but after finding this authentic one (complete with bunny rabbit and secret disappearing compartment!) at the party store, I couldn’t resist. I picked up the magic wand as well, but all the other elements we already had. Goose insisted that all magicians need a mustache. Originally, she wanted me to pick up a furry stick-on one in blonde because “it would look funny to have a black mustache with blonde hair!”, but I talked her into penciling one on with black eyeliner. She looked adorable and she was so excited about her costume, which is kind of the point, I guess. 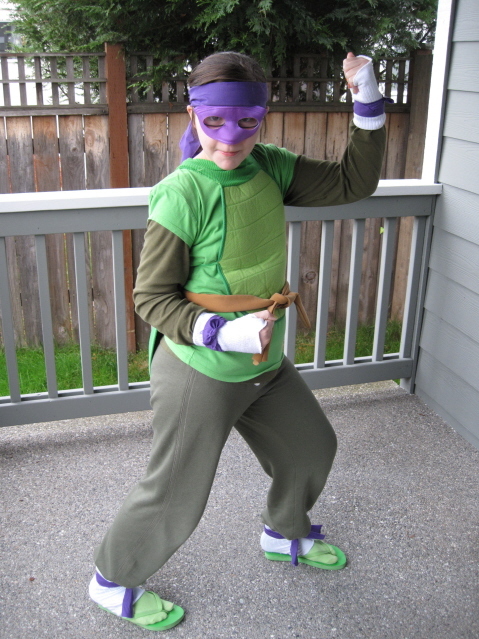 DynaGirl was at a loss until I jokingly suggested Mr. T’s Teenage Mutant Ninja Turtle costume from like a decade ago. She was all over that idea. Obviously the green jumpsuit Mr. T wore when he was four was not going to accommodate her 11 year old body, so I had to invest in a pair of green sweatpants. Everything else we already had, which is my favorite way to do costumes. I cannot begin to tell you how much I adore DynaGirl’s sense of humor and precocious sense of irony. The girls wanted me to dress up for our church party, but shot down every suggestion I made until finally I said, “I guess I could be a witch.” DynaGirl said, “Yes! That’s perfect!” I wasn’t exactly sure how to take that. BigHugs’ dance studio invited all the students to wear their costumes to class last week. I didn’t want to mess with the big Cinderella dress, so I had her dress in her usual ballet leotard and tutu and we added cat ears, a tail and whiskers. BigHugs was a little put out that she would not be wearing her “real” costume to class and complained that everyone else would be fancier than she was. I figured there would be quite a few cat ears and painted on whiskers, but I was wrong. Pretty much every child was dressed to the hilt as princesses and fairies, strawberry shortcakes and rockstars. Everyone looked very sweet and very fancy, and I was feeling pretty guilty until I saw the 7 year old little darling with the bloody hockey mask, bloodied clothes and bloodied plastic butcher knife. The contrast was…startling. Friday afternoon Chuck returned home from a weeklong business, and we spent a good portion of the evening chasing down the elusive carving pumpkin. Note to self: do not wait until the weekend of Halloween to purchase your pumpkins. We finally found some at the third grocery store. 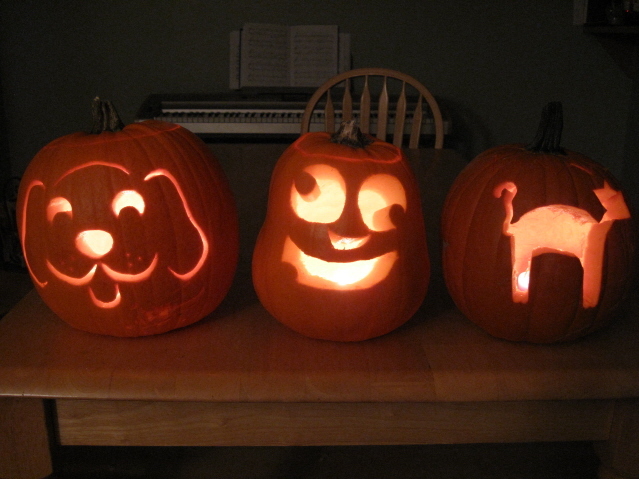 BigHugs went with a Halloween classic, the cartoonized puppy, DynaGirl stepped completely out of the box with a wacky face (she carved completely by herself), and Goose designed a cat silhouette that I promptly butchered, but she graciously proclaimed it her best jack-o-lantern ever. So all in all, a successful holiday. How was yours? P.S. I just realized I forgot to mention my Halloween scare! Yesterday morning I was coming down the stairs all ready for church with my heels on and carrying my 3-piece luggage set (it’s really just an assortment of totes, but that’s what it feels like—the amount of stuff I cart to church is just ridiculous), when about halfway down I tripped and skidded the rest of the way on my shins. It was perhaps my scariest Halloween moment ever. And maybe for my kids, as well. There may have been some screaming, and dare I admit, sobbing. I managed to escape with a 3 inch long bruise on my left forearm and a much smaller bruise and rugburn on my right shin, though both shins burned all the way to church and intermittently throughout the day. The incident left me shaken for most of the day, and it made me feel really old. I just may have to invest in a life alert necklace. Where’s the picture of your witch costume? What? No Mr. T costume or pumpkin? I love your inventive costumes. Susan—I somehow managed to forget to capture my witch costume moment. We went to a friend’s house for dinner last night, so we missed all the trick-or-treaters, too. On our way home, the majority of trick-or-treaters we saw on the street were teenagers. What did the kids dress up as? Boquinha—No, apparently Mr. T has passed the costume/pumpkin stage. Sniff. He did wear his gnome hat and beard to man the haunted house door at our ward party, but that was the extent of his Halloween participation. Cat was a Jedi (she wore a brown snuggie backwards) and Elijah just put on a scary mask he got at the dollar store. Great costumes. I will be really sad when my kids stop wanting to dress up. How cute are your kids? And how cute are you that you take such great pictures of them and all that. You must really be a mom (as opposed to my phoning it in). Speaking of carving pumpkins, this year I got a pumpkin so big we put three carvings on it and if we had gone all the way around we could have gotten in at least two more. I think that was a good way to go. We didn’t even do pumpkins this year…It was a busy week. I love DG’s turtle costume. She totally rocked it! The others were great too! We did the tri-ward trunk or treat on Saturday and came home with loads of candy. Big Sister was thrilled! Your falling down the stairs story sounds like something I would do. Except I would probably have cussed and since I tend to bruise, I would be covered even in spots that never hit the ground. Love the costumes and the pumpkins. My 5-year-old is quite taken with the puppy pumpkin. Julie—It was a bittersweet moment last year when Mr. T decided to stop dressing up. On the one hand that was one less costume I had to worry about, and on the other, my little boy was growing up! Alison—A community pumpkin! Love it! Flip—We almost skipped the pumpkins altogether, but our kids are big on tradition. And also guilt trips. 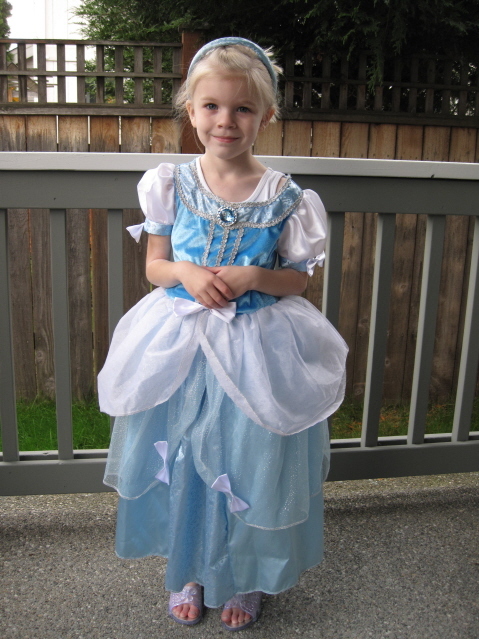 Mother—If you make yourself a Hobo Cinderella costume, I’ll make you some mice to go with it! Amanda—I usually bruise super easily too. My huge bruise was on my arm, and I don’t even remember hitting my arm. I fully expected by shins to be solid stripes of black and blue, but there’s only a couple of faint bruises on each leg. I was kind of disappointed. It seemed like there should be more evidence of my trauma than that. Ouch! I hate falling down stairs. The rugburn alone is traumatizing, but then there is the bruising, and also the sheer terror. The kids all look awesome. 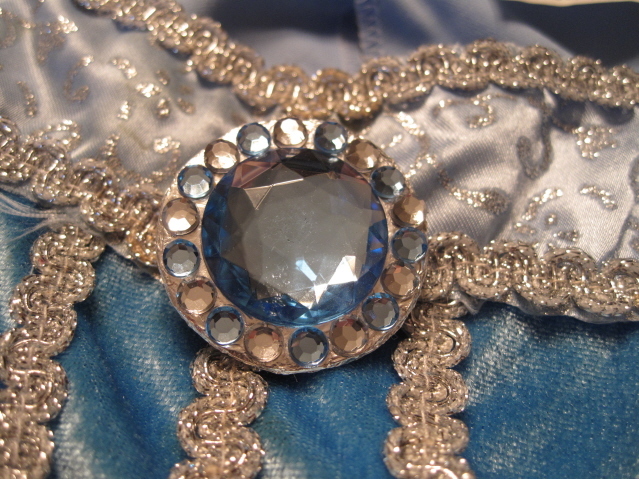 Your aluminum foil brooch is way classier than the original narcissistic princess brooch. GF wore PZ’s old Bullseye costume for Halloween. The preschool told the kids they could wear their costumes the last day of class before Halloween, and I considered talking her into something a bit more…practical–or at least less cumbersome–but she wanted to wear Bullseye, so I let her and told her she probably wouldn’t be able to wear it the whole day because, well, how could she even sit down in it with that big horse’s rump? But her teacher reported that she wore it the whole day. Sitting down was a challenge, but her friends helped her. Isn’t that nice?